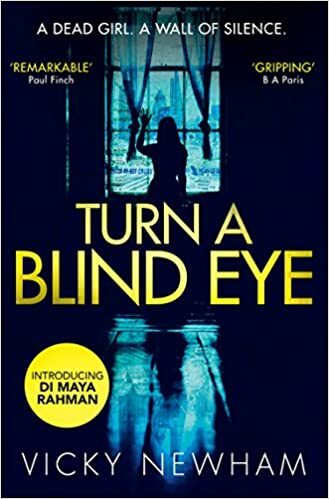 Turn A Blind Eye by Vicky Newham is an intelligent and confident debut and DI Maya Rahman is a character who will keep crime fans coming back for more. Vicky has created a complex case for her lead character to get to grips with in her first novel. This book is perfect for fans of Sarah Hilary’s Marnie Rome series. In her first novel, Vicky Newham introduces us to Bangladeshi-born Maya Rahman who is a detective inspector working in the metropolitan police. Set in East London, Maya and her team are called in when the body of a well-known and beloved headmistress is discovered at Mile End High School which also happens to be Maya’s old school. The school has been praised for opening its doors to the wider community in East London, so what has gone so disastrously wrong? But what is all the more perplexing to Maya is the murder’s links to the Buddhist community and the cryptic clues left by the killer. Is the headmistress’s murder also linked to the suicide of a young girl from the school, which took place months before and are there more murders about to take place? What can Maya do to prevent another one from happening? After reading Turn A Blind Eye, I know I am going to be putting Vicky Newham’s next novel straight to the top of my reading pile. There is a real sense of authenticity that she gives to her characters and to the setting, an area that she appears to know impeccably well. There were some strong, vivid images in this book, which really gave me the feeling as though I was there; I could see the streets and the characters forming around me so clearly. I’m a huge fan of writing that draws you into the setting and Vicky Newham definitely succeeds at this. Maya was a fascinating character to get to know. Vicky has given Maya an intriguing backstory which has made me want to find out more about her roots, it’ll be interesting to see how Vicky develops this plot line in future books. Maya’s sidekick, Dan Maguire is also a character who I would like to find out more about. I really liked his personality in the book; there were times when he lightened up the prose and I really liked his humour. I’m really excited to see what Vicky Newham comes up with next for Maya and her team. This is a really promising debut which will thrill crime lovers. Thank you to Lucy Richardson at HQ for sending me a copy of the book to review.